The Sunday of the 2012 Atlanta Jazz Fest had a decidedly international flavor with artists from different parts of the world showing us a mixture of jazz and their homeland musical styles. It was another great day of music, but for me, it was almost eclipsed by what I heard when I ventured away from the Mainstage for the first time. The day got off to a frustrating start, as the APD, which otherwise did an outstanding job of traffic control throughout the weekend, closed off access to the street that I had used to access parking every day since I first came to the AJF last year. This was doubly frustrating because this rerouting caused us to miss the performance of Hatian Jazzman Mushy Widmaier. Determined not to let this blip ruin the day, we settled in and prepared for the performance of Gregoire Maret, the Swiss harmonica master who has been making quite a name for himself of late. Mr. Maret is an excellent musician and he delivered a solid set; though at times some of the “quiet storm” style grooves that he laid down seemed more suited to late night at an intimate club, rather than a sweltering sunny Sunday afternoon in the park. When he tackled uptempo tunes, he did so with a stunning virtuosity that excited the growing crowd on the lawn. I have to confess that I saw the beginning and the end of Mr. Maret’s performance. In the middle, I took a harrowing ride on a golf cart to the other side of Piedmont Park; where I paid my first visit to the festival’s smaller venue, the International Stage. This stage drew a more intimate crowd, that was all about the music. The distractions of the large tents and people “stylin’ and profilin'” as they make their way around, interested more in calling attention to themselves than in hearing jazz; are vitrually non-existent at the International Stage. What you do get, are world-class musicians, just with less recognizable names. 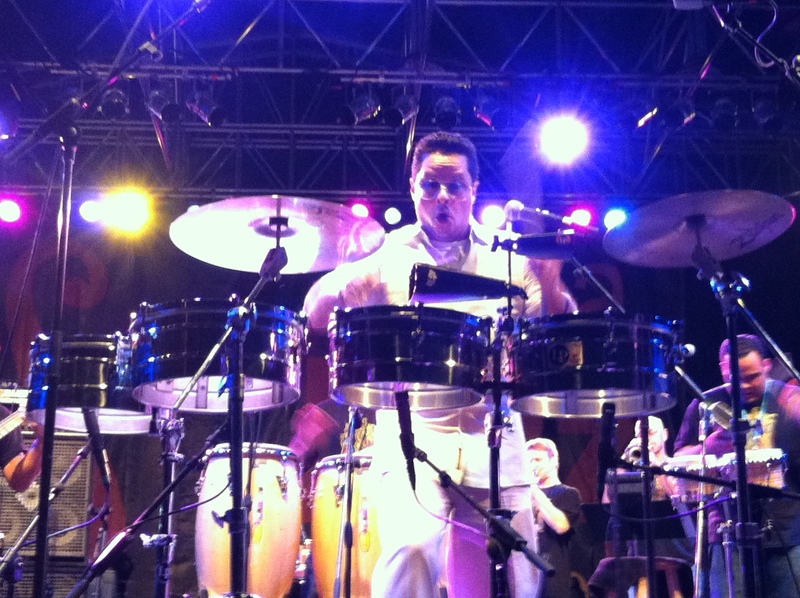 When I arrived, I was treated to the Son Jazzy Orchestra a Latin Jazz group, based in the Atlanta area. They commanded the stage with a fire that gave me goosebumps. I immediately whipped out my Flip camera and recorded the clip of their performance of “Night in Tunisia” that you see below. Please excuse my shoddy camerawork, as I was in motion during most of the performance. I also was interrupted in the middle by an attempt to arrange a ride back to the other side of the park, thus the inopportune break about 6 minutes into the film. I did return to catch the remainder of the performance. Other than the group’s leader, Nelson Ramos, I don’t know the names of the rest of the group and their web page didn’t provide much more info. As I do find out though, I will update this post. If I hadn’t left my family on the other side of the park, I would have likely remained at the second stage for a few hours longer, but sadly, I had to leave the International Stage and the Son Jazzy Orchestra after that one tune. But there were two more great artists awaiting when I returned to the Mainstage. 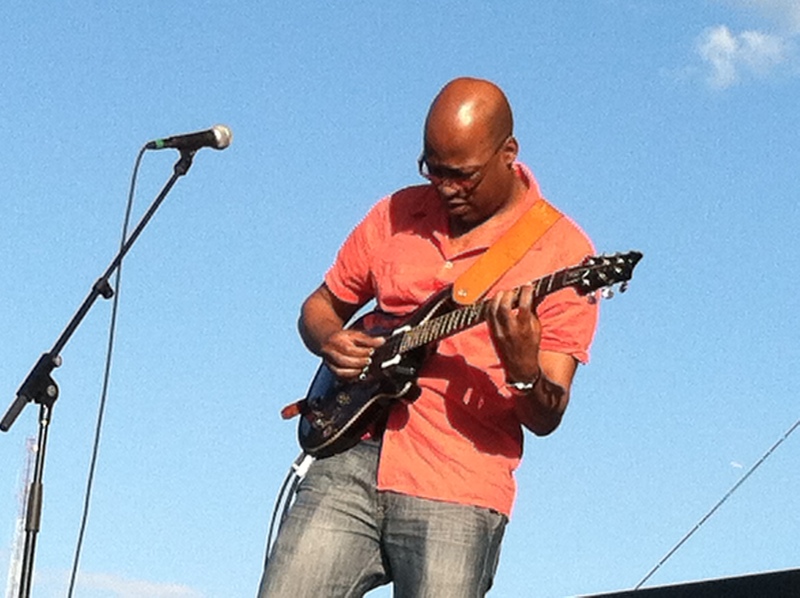 West African guitarist Lionel Loueke and his trio were next on the Mainstage. 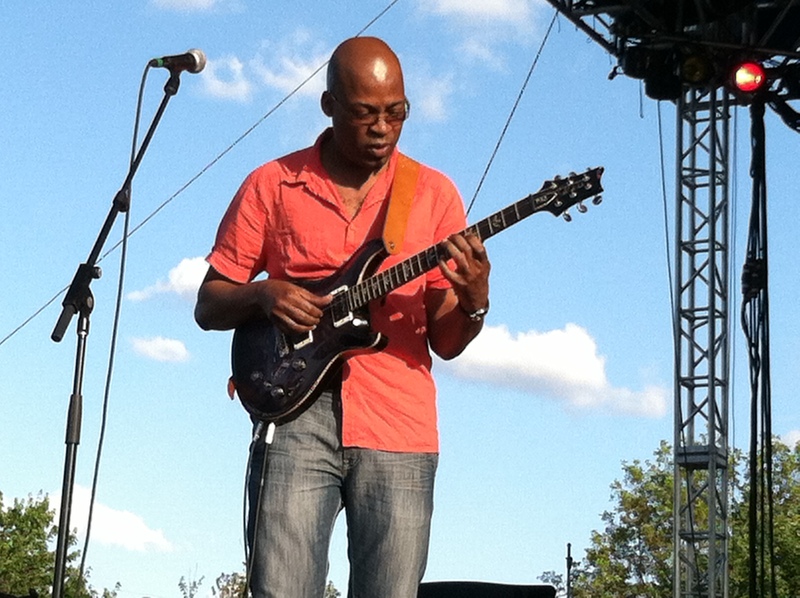 Many in the audience knew Mr. Loueke from his work with Terence Blanchard and Herbie Hancock, in additional to his two critically acclaimed albums for Blue Note. He captivated the crowd right off the bat with a beautiful sonic mélange that turned into “Skylark”. Mr. Loueke’s set consisted mostly of tunes that started with a beautiful theme, highlighted by his vocalizing. Then as soon as the audience was lured into a place of serenity, Mr. Loueke reminded us to not get too comfortable, as the music would veer off into jazz-rock themes that were often dissonant. From the looks on the faces of many in the crowd, many of the roads that the Loueke trio took were a bit confusing; but he would always return us home safely. 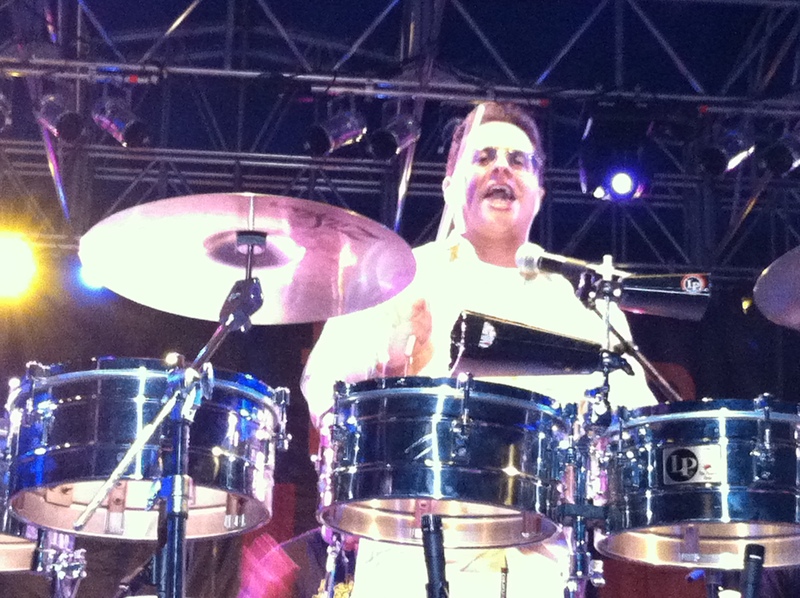 The evening closed with a set from Tito Puente, Jr., who has now decidedly stepped into his late father’s shoes as “The Mambo King”. He is also every bit the gregarious and gracious showman that his dad was; arriving early to spend a bit of time with us press types and staying late to patiently sign autographs and listen to reminiscences from those in the audience affected by his father’s music. Puente, Jr’s band was hot and road tested, as they cranked out the classics from the Latin Jazz canon, “Tanga”, “Manteca”, “Ran Kan Kan” and many others. 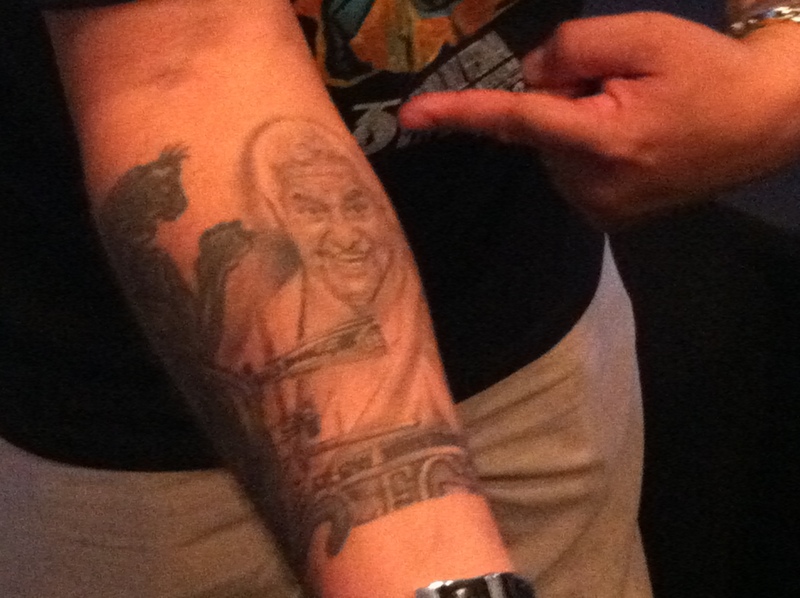 Tito, Jr. also told many heartwarming and humourous stories about himself, his dad and the music that made them famous. He also slipped in a few numbers from his own song book, such as the fiery “Junior’s Mambo”, which Tito, Jr. composed for his three-year old son, whom he referred to as “Tito Junior, Junior”. Though there was no official dance floor impromptu ones sprang up all over the packed lawn, as people grooved in whatever way they knew how, to the infectious rhythms. Just when you thought they were finished, Tito told a story about a song that his father composed in the late ’60’s that was then made famous by a 19-year-old guitarist named Carlos Santana. The pianist then hit that familiar syncopated block of chords and a near-riot broke out… With a big grin, Junior then held out the mike to the crowd, saying “I know y’all know it…sing it!” And thousands who had never spoken a word of Spanish in their lives, were now singing “Oye Como Va” at the top of their lungs. It was a great end to a great second day. The best news was that there was still more to come on Monday on both stages. 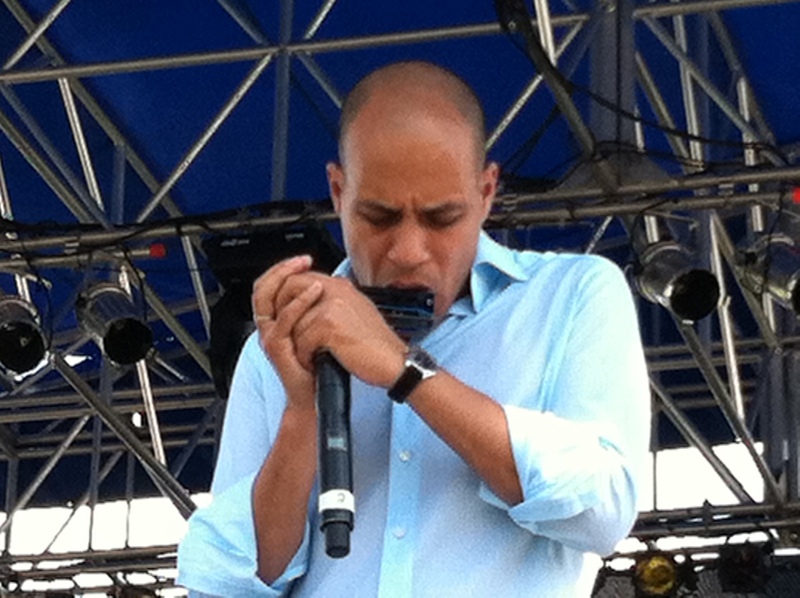 This entry was posted on June 5, 2012 at 12:13 pm and is filed under Atlanta Jazz Festival 2012, JazzLives! with tags atlanta jazz festival, Grégoire Maret, jazz lives, latin jazz, lionel loueke, Mushy Widmaier, son jazzy orchestra, tito puente, tito puente jr.	You can follow any responses to this entry through the RSS 2.0 feed. You can leave a response, or trackback from your own site. How dare you miss Mushy Widmaier? Rewind the clock and go back out there. How dare you miss Mushy Widmaier? Now rewind the clock and go back out there. Cairo Qween can give you all the names in the video.